Gainesville, Florida has a growing urban art scene, with new street art and murals popping up all around the city. 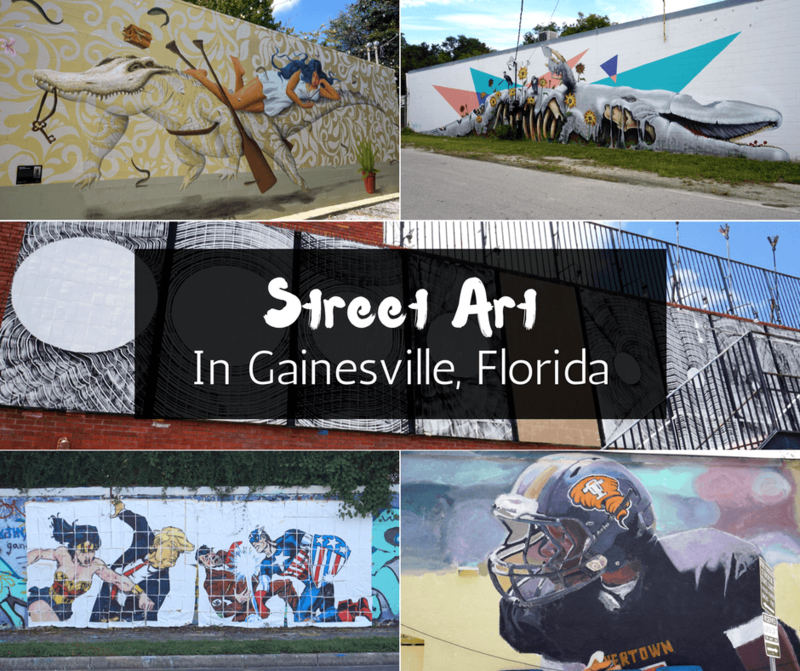 We had no idea that Gainesville had such a growing art scene and that street art was getting more and more popular there. As we roamed the city visiting various parks and museums we were pleasantly surprised to see random murals and stopped at as many as we could to take photos. We may or may not have done some illegal u-turns to go back to murals we passed lol! The city of Gainesville has really embraced the culture of street art and has invested in various projects around the city, including the 352walls, an initiative whose mission is “to position Gainesville as a vibrant cultural destination, stimulate urban renewal, foster cultural tourism and economic development, beautify the urban landscape, boost community pride, and serve as a platform for urban art studies.” On their website, you can find a map to see where the 27 walls and 7 utility boxes are located around the city. Yes, not only does Gainesville have awesome street art, but they also have awesome utility boxes. Artists have come from all over the world to paint in Gainesville, and there are some that came from just down street. One of my favorites was the mural done by L.E.O., a street artist from Miami. He painted a mural of 16 year old Richard Hall, an aspiring football player who was killed by a stray bullet in Miami in 2014. Miami street artist Reginald O’Neal, aka L.E.O. The Teaching Wall is dedicated as a blank canvas, a place where artists can practice and experiment their techniques. The Gainesville Collective is also part of the 352walls, and is a collaboration between various local artists. Blake Harrison, Tiara Henderson, Jefreid Lotti, Carrie and Jesus Martinez, Turbado, Rachel Sommer, Luis Justo Rodriguez, Evan Galbicka, Clea Lauriault, and Jenna Horner. We also found a few other murals and paintings around the city that seemed to be in the most unlikely spaces, but we really liked them. Another area where you can find interesting street art and graffiti in Gainesville is at the 34th Street Wall. This wall is 1,120 feet long and in some areas has as many as 250 layers of paint! It’s been around a long time and is constantly being painted over, mostly by locals and University of Florida students. You can find anything from sports related paintings, to marriage proposals. What we think is really cool is that the city considers this a landmark and the police have never charged anyone for painting on the wall. In fact, when the wall was in jeopardy of being removed because of efforts to widen the bike lanes on the street, the city chose to instead narrow the road median. The city even leaves waste containers to allow for proper disposal of used paint supplies! So yeah, the street art scene in Gainesville, Florida is pretty cool! We know that it’s just going to keep growing too, so we can’t wait to go back and see what new murals pop up around the city. I love the vibrant colors and stories the murals tell. Thank you for a great introduction into Gainesville, Florida. The street art is amazing. My favorite has to be the lady on the alligator by Puerto Rican street artist David Zayas. I also love how supportive the city is of all the street artist. It shows with the quality of the street art you can find. Wow, these paintings are beautiful. I love street art so much, it really gives so much character to a place. Why have plain walls when you can have a work of art? I love that street art gives so many different messages. We were just in Montreal, and they have a lot of street art, too. Some of it is making apolitical statement, while some just memorializes a person or a thought. Some of it is only meant to be beautiful! I love seeing it all! I need to start traveling with you more. You find the BEST street art that I’ve ever seen!! Well done, I love how colorful and vibrant the Gainesville murals are! I didn’t see even half of these. I have not been to Gainesville, and prior to your post, had never read anything about it. Now that I know it is an art destination, I will give it some serious thought. As a Gainesville street artist and facilitator, Thank you for the article. These photos are actually about only 30% of Gainesville’s street art murals. Feel free to contact me and If you’re interested in seeing what else this city has.